Evolution's unique OSI solution brings flexibility never before seen on the DMS landscape. OSI is a level of web services, which produce an Application Programming Interface (API) for third party partners of Gemini Systems. OSI enables our partners to quickly develop 2-way integration with Evolution, granting access to customer account information, vehicle information, service booking availability, vehicle stock information and much more. It also allows our partners to ‘post’ data live into the DMS, such as new customer records or sales order forms meaning the two systems can be effectively synchronised at all times. Integration with 3rd party solutions such as Key Tracker, eDynamix, Manheim Auctions, Reef Business Systems and CloseIt CRM means you get flexibility and functionality without the double entry. By maintaining this API Gemini Systems uniquely allow our dealers to update their DMS data directly from third party applications, often where manufacturers have imposed the software requirement on them, and escape the necessity for re-keying of information, and the problem of inconsistent data. 2-way integration via OSI allows Manheim Auctions to send purchased vehicles directly into a 'Pending Vehicles' area in the the dealers' vehicle stock book. The dealer is able to see the vehicle purchase information and can accept the vehicles into stock with a couple of clicks, significantly reducing administration overhead and vastly increasing the speed that stock can be advertised and sold. 2-way integration with CloseIt's Showroom CRM offers users of Evolution the ability to use their desired showroom system without having to double key information back into the DMS. Stock and customers is synchronised and any deposit, order or part exchange entered into CloseIt is immediately visible in Evolution. Key Trackers innovative electronic Key management system offers an advanced and secure platform to track and manage keys within the dealership. The integration via OSI allows for automated live updating of Site and Key Number information in the vehicle stock book as soon as a key is taken or replaced in the key board. Reef offers one of the most widely-used, profit increasing deal optimisers the Automotive Industry has ever seen. Live 2-way integration via OSI offers dealer the unique ability to operate both Reef and Evolution in conjunction with each other. Stock, customers and deal information is synchronised across both solutions reducing the need for double entry and removing the chance of user input error. 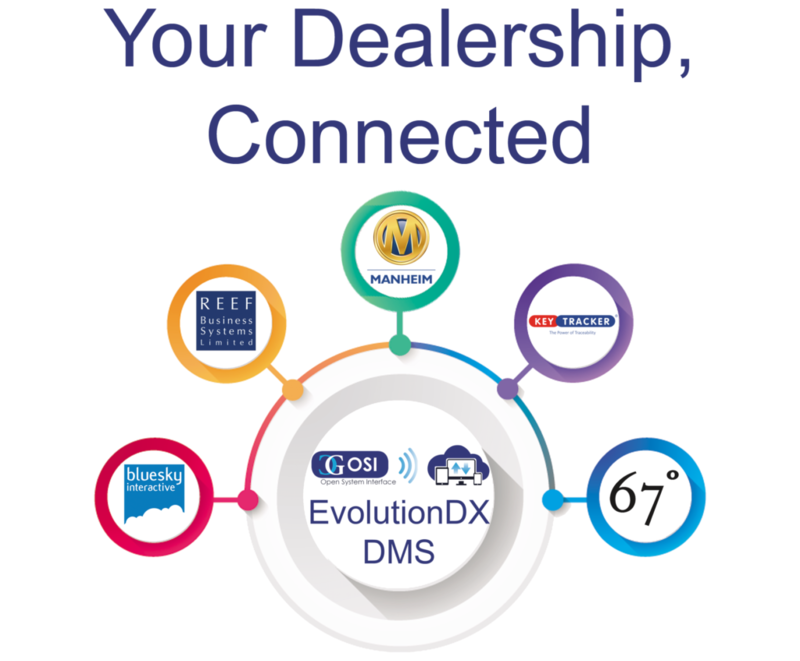 67Degrees integrate with OSI to pull vehicle stock directly form the DMS, ensuring your website is always live and up to date with the very latest stock and availability. If you are a client, prospect or third party provider interested in OSI please contact us here. Having multiple OEM contracts often means several sets of dealer standards, some of which require the prescriptive use of certain showroom systems or on-line booking facilities. OSI allows these third party providers the ability to integrate live directly into Evolution which reduces duplication of data and re-keying of information. If you have specific solutions or applications that best suit your business and in-house processes, OSI gives the flexibility for you to continue with the solution which is already ingrained in your business and its people rather than opting for our integrated modules. No other DMS in the UK market offers such an open-door policy meaning, with Evolution, you will be able to harness the power of a fully featured DMS, satisfy your franchise requirements and utilise the best in class products available to you - And all of this will be achieved with integration meaning no messy re-keying and expensive duplication overheads.